When Nissan introduced the Juke in 2011, its hip styling in a rather bland segment made it a near immediate hit. To this date, it is still the swan in a class filled to the brim with ugly ducklings. Add to that a base turbocharged engine that pumps out 188 horsepower and 177 pound-feet of twist that allows it to hit 60 mph in just 7.3 seconds, even with a cruddy CVT backing it up. That was 2011 and now we are moving into the 2015 model year, so it is time for a mid-cycle refresh. 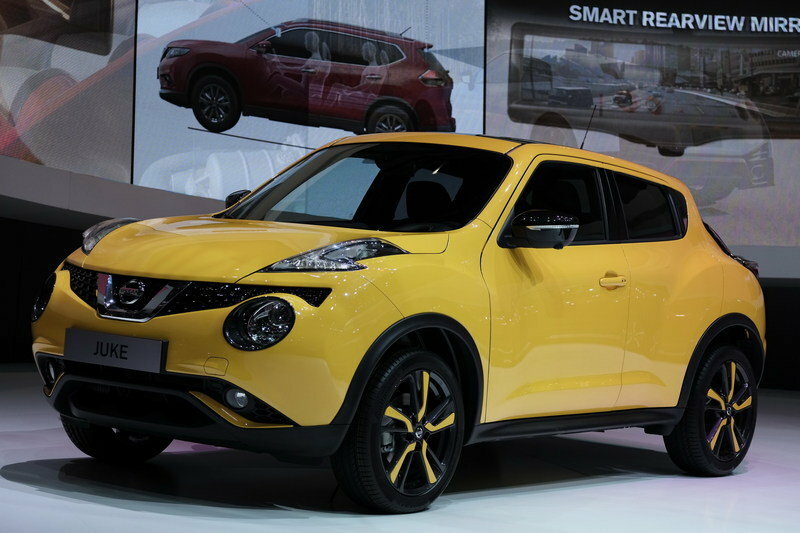 And a refresh the Juke received, as Nissan unveiled the Euro-spec Juke at the Geneva Motor Show this week. Sure, a few of the engines won’t make their way to the U.S., but we did get a nice look at how Nissan added in its new design language and revised the only U.S.-bound engine: the 1.6 DIG-T. Overall, the refresh is, well, refreshing. The Juke looks like a whole new car, despite sharing most of its sheet metal with the 2014 model. Unfortunately, the Juke’s interior is largely carried over, but the interior was never a complaint, except for cargo space, which was address with this refresh. 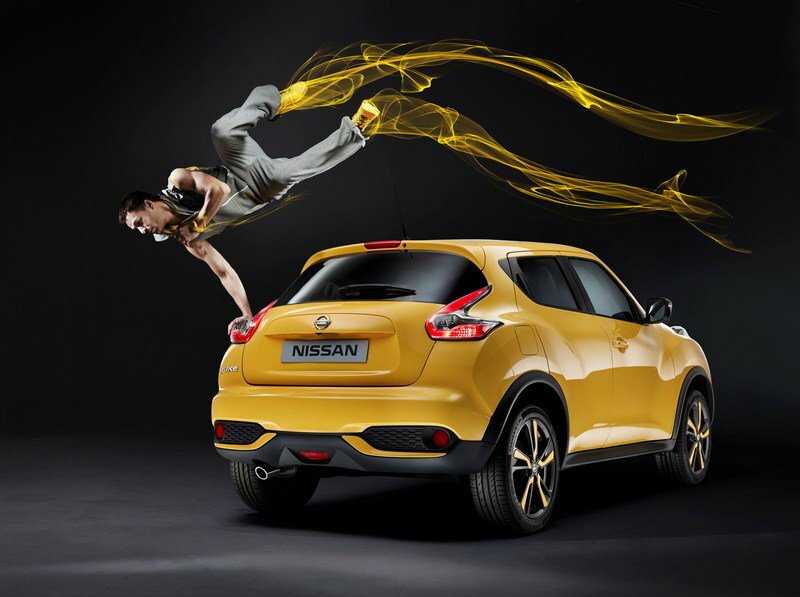 Click past the jump to read more about the 2015 Nissan Juke. completely undermine the Juke’s design language, but it knew the model was due for a refresh. 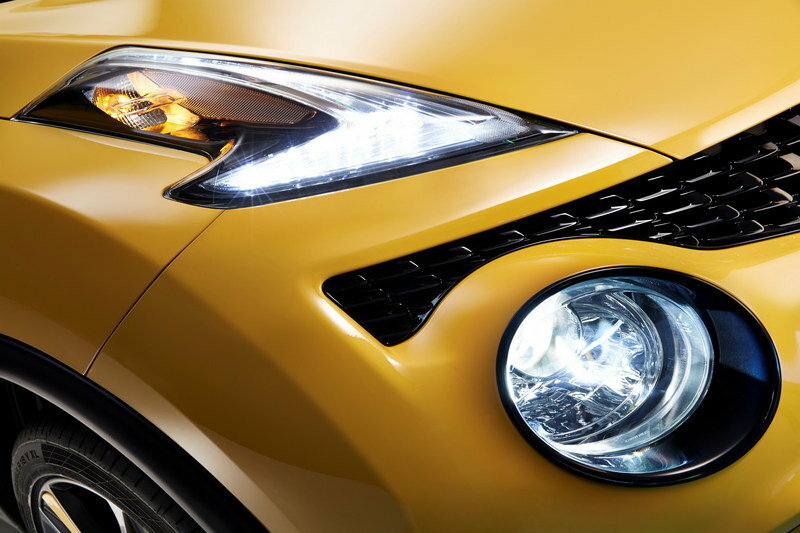 Up front, the new Juke gets revised headlights to match the rest of the Nissan lineup. These restyled headlights include new bi-intensity LED running lights and xenon headlight bulbs. The changes continue with the front bumper becoming more flush with the grille and an all-new insert under the bumper to give it a sportier look. On the sides, the only changes are new turn signals integrated with the side-view mirrors and new cameras for the available All Around Monitor. Around back, the boomerang-style taillights received a light revision and a new LED lighting system. The rear bumper also got a healthy dose of new styling with faux, angular air outlets, round reflectors and a new under-bumper insert that adds a little sportiness to the compact crossover. Rounding out the changes are three new exterior colors — Sunlight Yellow metallic, Ink Blue metallic and solid Red — and a new palette of wheels to choose from in 16-, 17- and 18-inch sizes. Not much changes on the inside of the new Juke, with exception of the new base grey hue that gives the cabin a more techy feel. 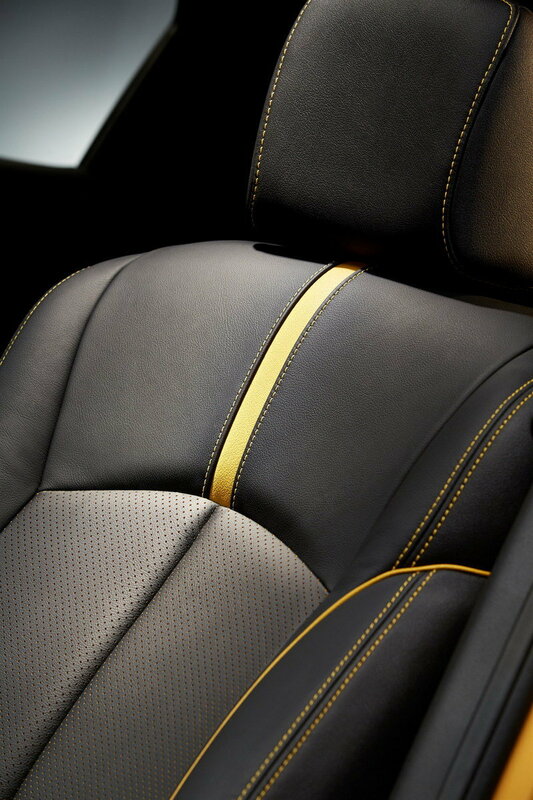 Buyers can also opt for interior packages that add hints of red, white, black or bright yellow. When you open the rear hatch, you will notice the biggest change to the interior, as Nissan restyled the cargo area’s layout to enhance its cargo capacity. In two-wheel-drive models, the trunk space actually grows by 40 percent to 354 liters (12.5 cubic feet) with the seats up. Nissan also revised the rear-folding seat to allow it to fold completely flat, adding even more cargo space. A new two-stage floor adds even more versatility to the cargo hull. Since Nissan has only revealed the European specifications, I’ll have to decipher what will make it to the U.S. and what likely will not. The engine that I can assure you will not make its way to the U.S. is the 1.5-liter dCi diesel, which puts down 81 kW (81 horsepower) and 260 Nm (191 pound-feet) of torque. This diesel engine is a direct carryover from last year’s model. An all-new 1.2-liter DIG-T gasoline engine replaces the old 117 PS, 1.6-liter engine in Europe, and could possibly find its way into the U.S. as an entry-level engine, but it is unlikely. This small-displacement, turbocharged engine puts down a respectable 85 kW (113 horsepower) and 190 Nm (140 pound-feet) of torque. This tiny engine uses auto start/stop technology to reduce CO2 emissions to just 126 g/km and reduce fuel consumption to just 5.5 liters/100 km (43 mpg) — that accounts for a 13 g/km drop in emissions and a 2.2 liter/km (13 mpg) drop in fuel consumption from the 1.6-liter it replaces. The engine that I am sure will be the only one in the American lineup is the 1.6-liter DIG-T, which Nissan revised with higher compression, reduced internal friction and a cooled exhaust gas recirculation system. This amounts out to 140 kW (188 horsepower) — the same as last year’s 1.6 DIG-T — and a peak torque at lower engine revs. The real changes to this engine show in terms of its emissions, as this engine now puts out just 139 g/km of CO2 — a 20 g drop from last year’s model. There is no mention of the standard gearbox, but I am willing to bet that the five-cog manual will carry over from last year. Optionally, buyers can opt for a six-speed manual on the 1.6 DIG-T engine or a new Xtronic transmission for increased fuel economy. We’ll bring you all of the American specifications one Nissan releases them. There is no information on pricing yet. gorgeous, but the outside is still hideous. The Nissan certainly trumps it in outward looks, but the Kia still has its number is useful interior. 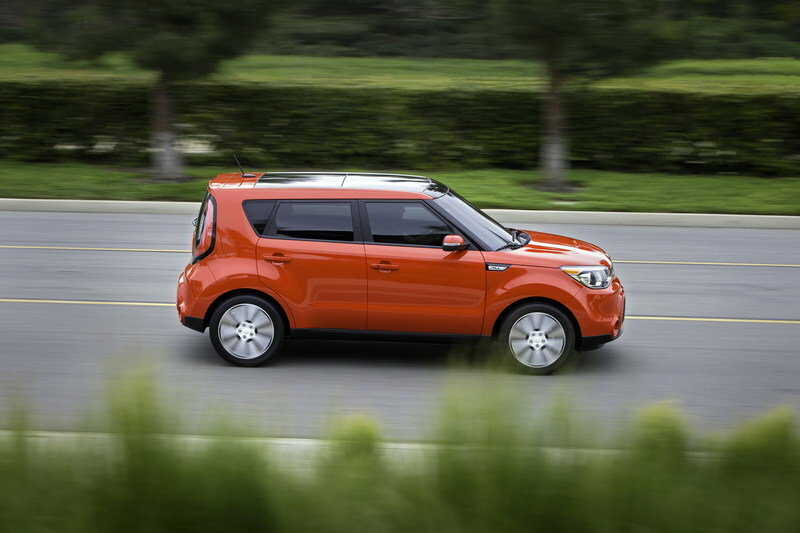 Unfortunately for Kia, the Soul’s rear seats do not fold flat, leading to a tougher time loading cargo. 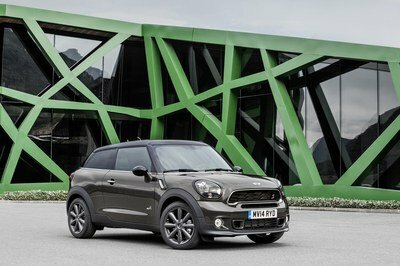 the Soul also loses steam in the power department, as the Juke’s 188-pony four-pot crushes its most powerful offering by 24 horsepower. 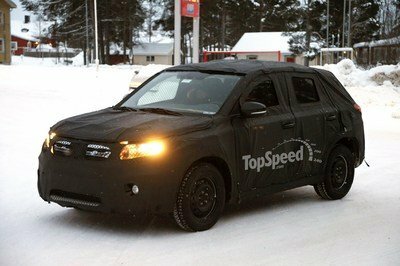 I am sure Kia will soon respond with a turbo version of the Soul, but that has yet to happen. 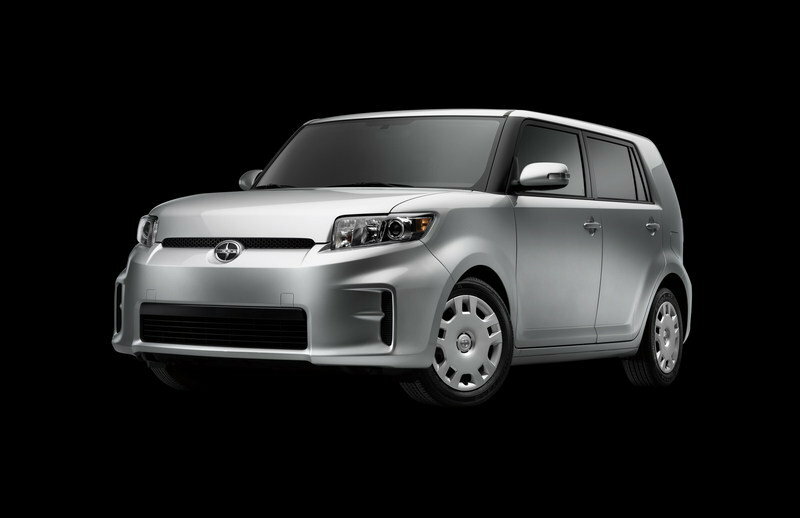 There’s something about the compact crossover realm that makes automakers lose all concept of design, as the Scion xB is even uglier than the Soul... To boot, the xB’s cabin is very cheap and dated, and its 158-horsepower engine is nothing to write home about. 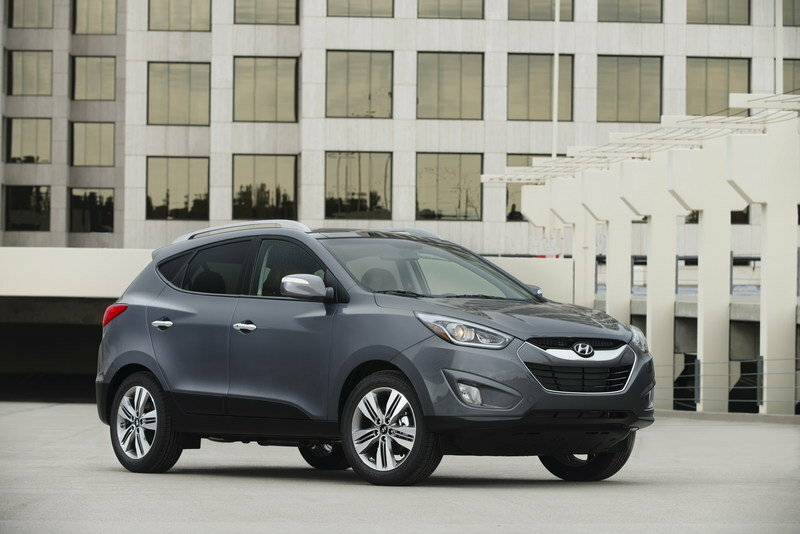 Now, if you’re looking for something that is not a cube on wheels, and are will to spend more money and go a little larger, than you can look into the Hyundai Tucson. In 2014, the Tucson checked in about $2k more than the Juke, but it featured a larger cabin, 25.7 cubic feet of cargo room and an optional, 182-horsepower engine. In a class of underpowered cubes, the Juke is the obvious winner. It has all the style that others in its class lack, and in order to match its styling, you have to move up into a pricier segment of crossovers. The Juke does, however, still offer little cargo room with the seats up and not much more with the seats folded. On the other hand, it performs really, really well. When it arrived a little more than three years ago, the Nissan Juke used innovation to create a whole new market segment. Just as the Nissan Qashqai pioneered the original crossover market, the Juke used dramatic design and advanced technology to break new ground in a more compact crossover package. The Juke’s combination of highly individual styling, strong driving dynamics and sophisticated interior equipment has allowed it storm from zero to 420,000 sales in less than 40 months, easily eclipsing its rivals. Now, following Nissan’s established practice of constant development comes the next chapter in the Juke story. Establishing itself as the original stand-out model in the growing small crossover market with premium style and refinement, the new Juke is ready to once again stamp its authority on the segment it created. Already recognised as the design trend-setter, the new Juke benefits from a series of design enhancements, new engines, new equipment and a wide-ranging personalisation programme. Among the changes are a new design at the front and rear with greater emphasis on both premium refinement and sporty design cues; a new downsized 1.2-litre turbocharged engine offering greater performance, economy and lower emissions; a revised 1.6-litre DIG-T engine; improved four-wheel drive with Torque Vectoring System; new alloy wheels; advanced equipment including a new audio system, the latest generation NissanConnect driver-vehicle interface, Nissan Safety Shield, Nissan’s Dynamic Control system, plus the option of a new opening glass roof. Revisions in the luggage area have increased space by 40 per cent in two-wheel drive versions up to 354L, while there’s even greater opportunity for owners to really stamp their own personality on their Juke. A range of new colours and interior themes are available with a number of different personalisation packs. The changes and range additions will accelerate the growth of Nissan’s second most popular model in Europe, helping it to emulate the remarkable achievements of its big brother Qashqai. Juke is the best seller in the premium B-segment, outperforming all direct competitors including those from the top German brands. And it’s not just the entry-level models which have helped Juke to the top: the best selling engine to date has been the 1.6-litre petrol unit while the top Tekna grade accounts for more than one third of all sales. 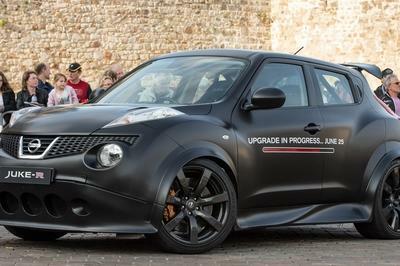 But the big Nismo news is the advanced preview of the extreme new Juke Nismo RS, a totally focused model with more power (218PS/160kW), upgraded brakes, a stiffer body and a limited slip differential on two wheel drive versions. Full details on Nismo RS models can be found here. Buyers have also been attracted by a strong range of special versions - notably the Shiro and the advanced n-tec models - and the Kuro and Ministry of Sound limited editions, while the sports oriented Nismo has added driving thrills as well as breadth to the range. On its way to a total of 420,000 sales, Juke has achieved 135,000 sales in 2013 with its popular set to increase with the introduction of the new version. All Juke models sold in Europe are built in Europe, at Nissan’s highly productive plant in Sunderland, UK where three shifts per day are needed to cope with demand. Significantly for Nissan, Juke has attracted a huge number of buyers new to the brand. As much as 85 per cent of sales have been to first-time Nissan owners, not only making it the highest conquest model in the Nissan range but a model that comfortably outperforms the B-segment average with many of those new buyers downsizing from larger cars. "We stunned the industry with Qashqai, the original crossover, and we’ve done it again with Juke. 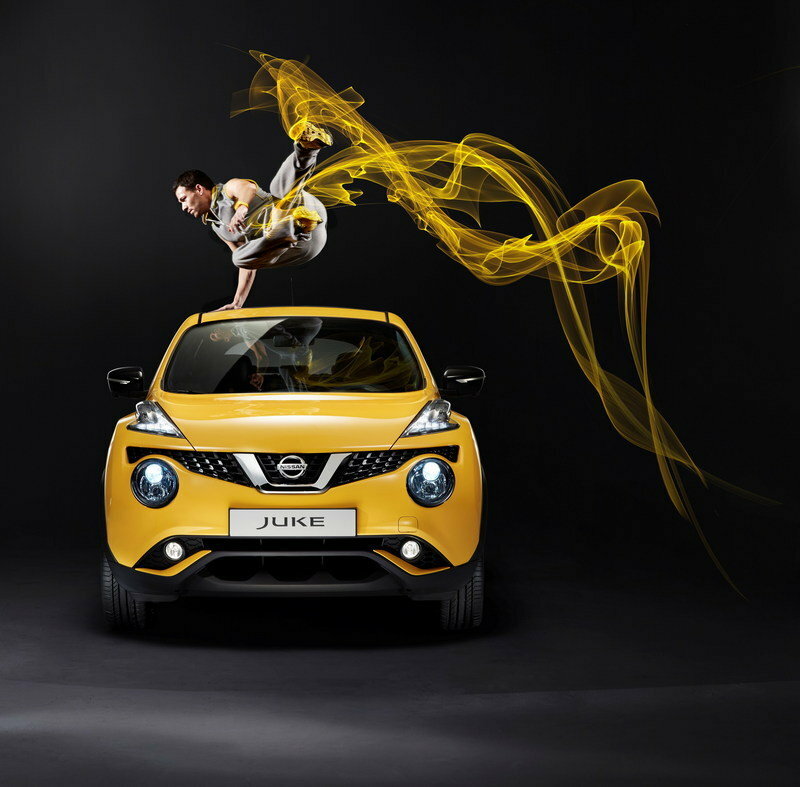 If anything, Juke is even more daring and different than Qashqai and appeals to a younger, more out-going audience. 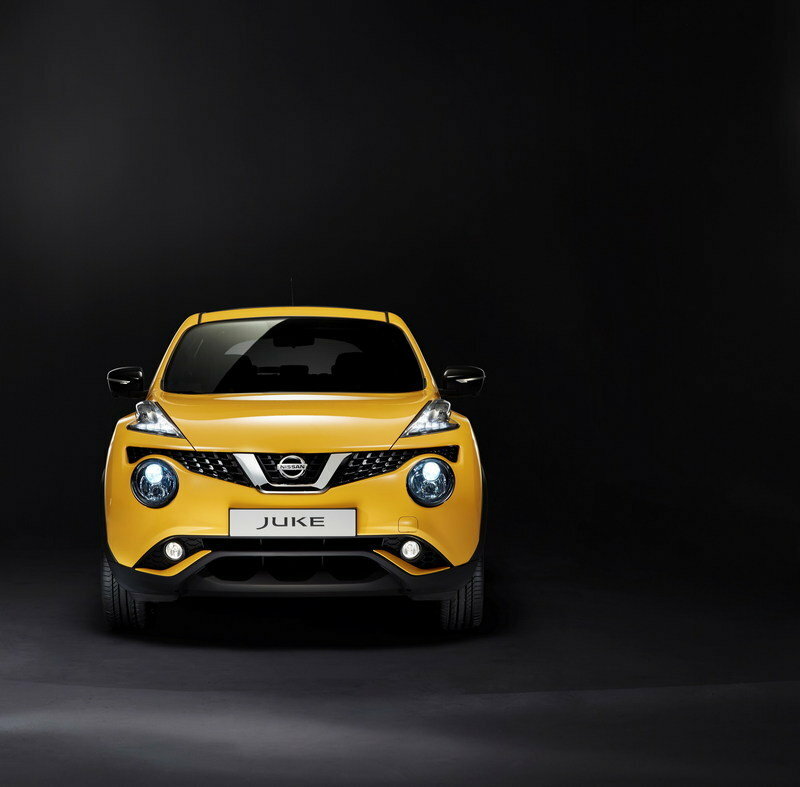 "The changes we have made to new Juke will extend that appeal even further to cement Nissan’s position as the leading brand in the crossover market," said Guillaume Cartier, Senior Vice President, Sales and Marketing for Nissan in Europe. 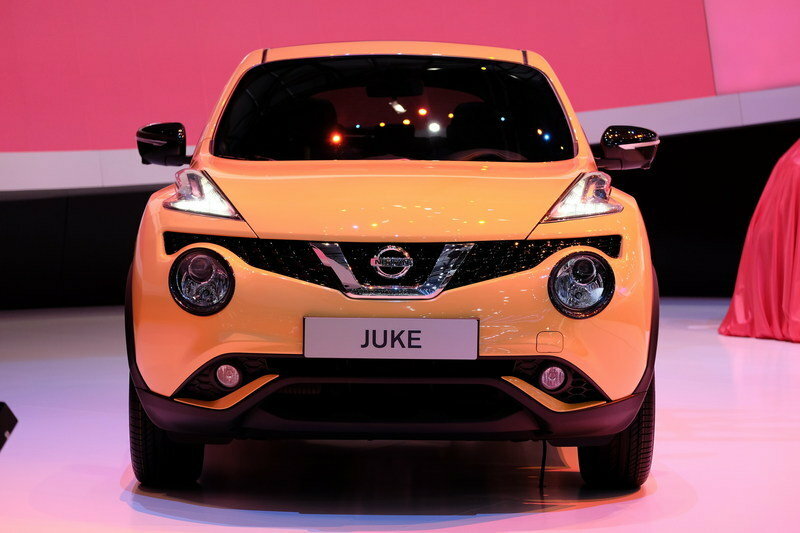 New Juke will go on sale across Europe in the summer, 2014. Bold design has always set the Juke apart from any rival, offering a mixture of crossover toughness with sporting appeal that has seen it become a design icon. To radically alter the proportions would undermine the Juke’s unmistakable presence, but designers have still managed to make significant changes to the car’s styling. At the front, the upper lamps have been redesigned and now incorporate bi-intensity LED daytime running lamps while the headlamps now have Xenon bulbs for better visibility and new lens covers. The grille incorporates the new Nissan brand signature while the front has been toughened with new and more robust trim beneath the bumper. 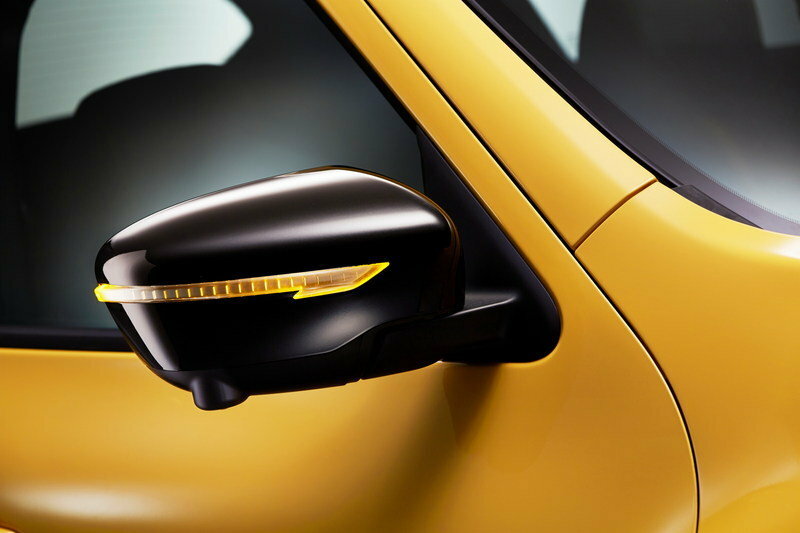 Door mirrors have been revised to include LED side turn strip repeaters and, where fitted, cameras for the Around View Monitor. 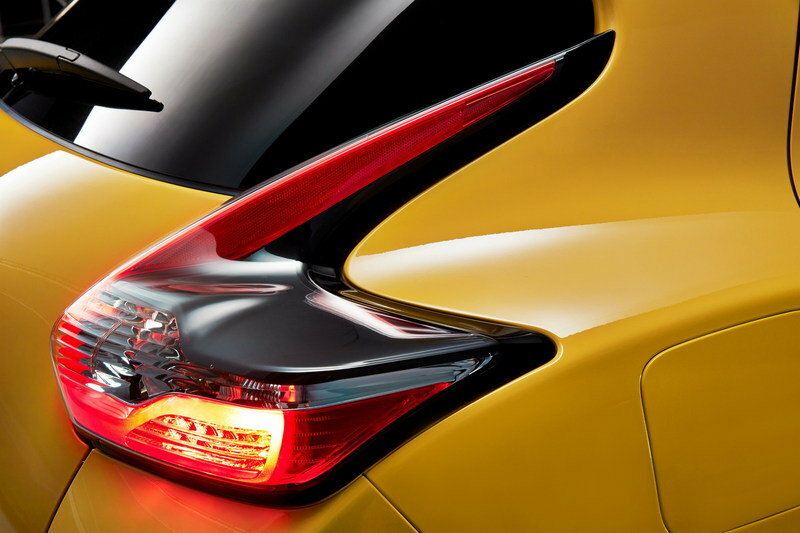 At the rear the bumper has a more aggressive shape to match new revised boomerang tail lamps with LED light guide technology, giving the new Juke a more distinctive appearance at night. The new colour palette now extends to ten colours and includes three new shades: Sunlight Yellow metallic, Ink Blue metallic and solid Red. A new range of wheels completes the exterior revisions, with 16-inch steel and alloys available on entry-level Visia models and different styles of 17-inch alloys on Acenta and Tekna variants. A new 18-inch alloy wheel will also be available with coloured inserts available allowing drivers to add their personal touch. In addition, the extensive new personalisation packs include the opportunity to add drama with brightly coloured inserts which completely change the look and feel of the wheels. Different packs also allow contrasting colours to be applied to the mirror caps, side sills, roof spoiler and door handles. 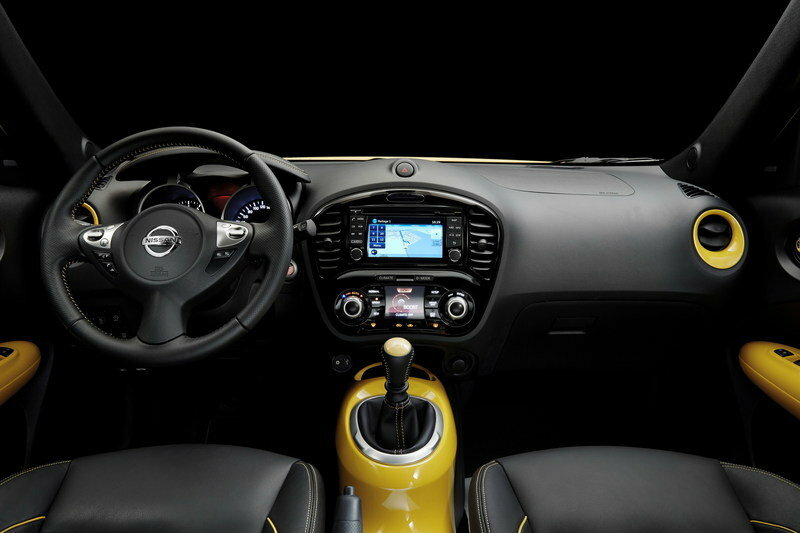 In the same way that the exterior styling differentiates Juke from anything else on the road, so the interior has a number of distinctive features, including the centre console inspired by a motorbike. And again, changing these features for the sake of it would be counter-productive. 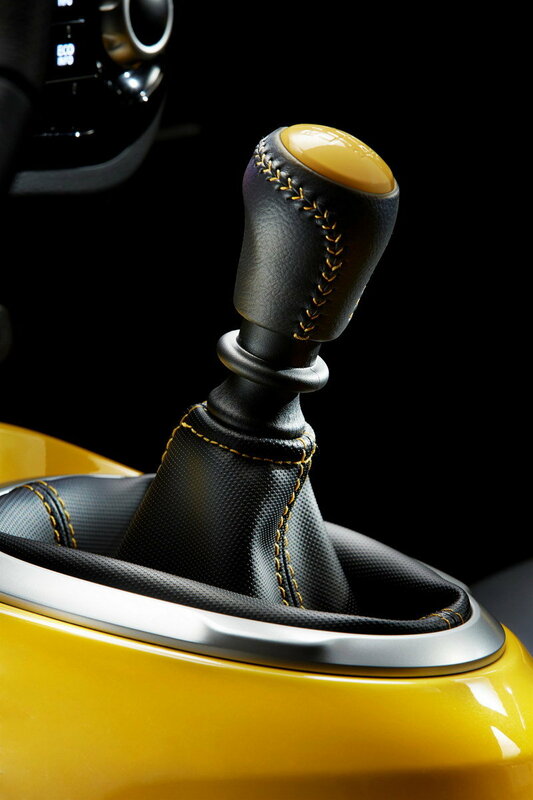 Instead Nissan designers have found ways to make the interior even bolder and more dynamic with different interior themes. 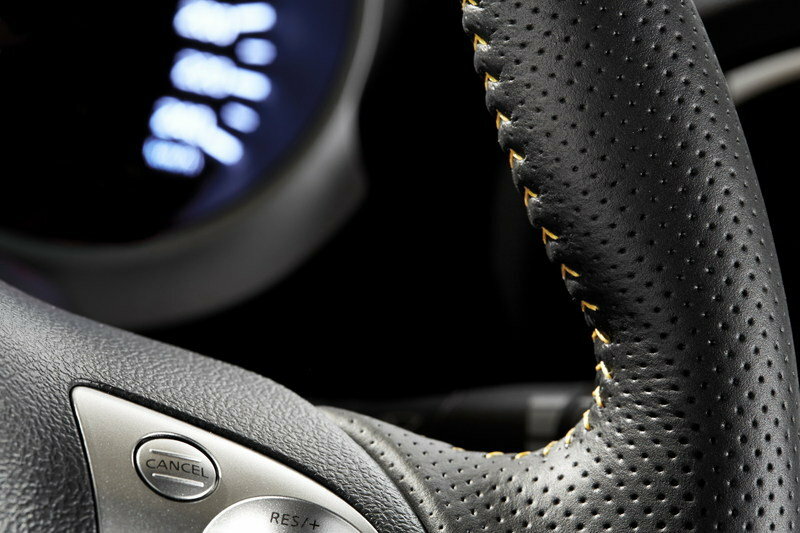 In standard cars, the interior theme is a sophisticated grey, giving a technical feel to the car. Add one of the interior personalisation packs and features such as the centre console, door trims and other elements can be coloured red, white, black or even a bright yellow. 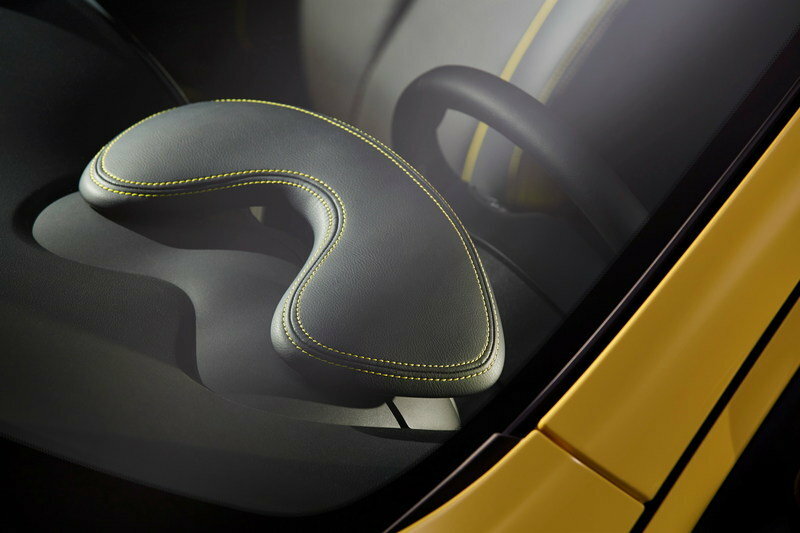 Depending on the model, there are two styles of fabric for the seat upholstery - comfort and sport - with leather trim on top versions. 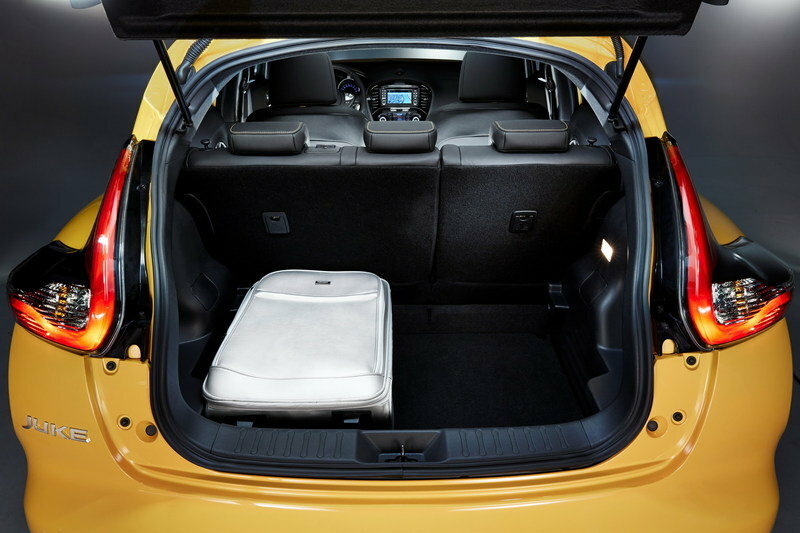 Changes have also been made to the shape of the trunk area in two-wheel drive models to boost luggage space by an impressive 40 per cent, taking the overall capacity to a class-leading 354 litres ­­- unlike rivals, Juke can carry a large and a medium suitcase at the same time, and is also deep and wide enough to carry a chassis-type pushchair. Versatility is further enhanced with flat folding rear seat, making it easier to load large objects, while the inclusion of a two-stage floor in the luggage area makes the space even more flexible. Standard equipment on all models includes LED daytime running lamps, CD radio with an AUX-In socket, gear-shift indicator to promote a more efficient driving style and tyre pressure monitor. The Visia 1.5 dCi and 1.6 Pack versions add alloy wheels, manual air conditioning, drive computer and driver seat height adjustment. Acenta models are enhanced with front fog lights, 17-inch alloy wheels, automatic air conditioning, remote audio controls, Bluetooth connectivity for phone and audio streaming, cruise control and limiter, Nissan Dynamic Control System and chrome interior touches. Enhances for the new Juke, Nissan Dynamic Control is an advanced driver control system giving the choice of three different driving modes - Normal, Sport or Eco ­- along with instant driving information and vehicle setting controls. 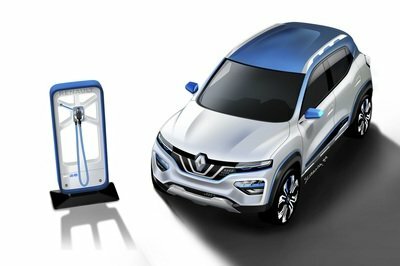 Tekna models add power folding door mirrors, light and rain sensors, i-Key with Start/Stop and the latest NissanConnect with rear-view parking/reversing camera, Around View Monitor and Safety Shield. NissanConnect now offers smartphone connectivity with access to a variety of apps ranging from social media platforms to entertainment including internet radio through a large, 5.8in colour touch screen. The latest generation satellite navigation system integrates with Google® to reveal a host of useful information from weather forecasts to the location of fuel stations, hotels, restaurants and many other points of interest. A send-to-car function also allows drivers to search for their destination at home and send destination instructions to NissanConnect system at the click of a button. The system includes Bluetooth audio streaming and mobile phone integration as well as Aux-in and USB slots. 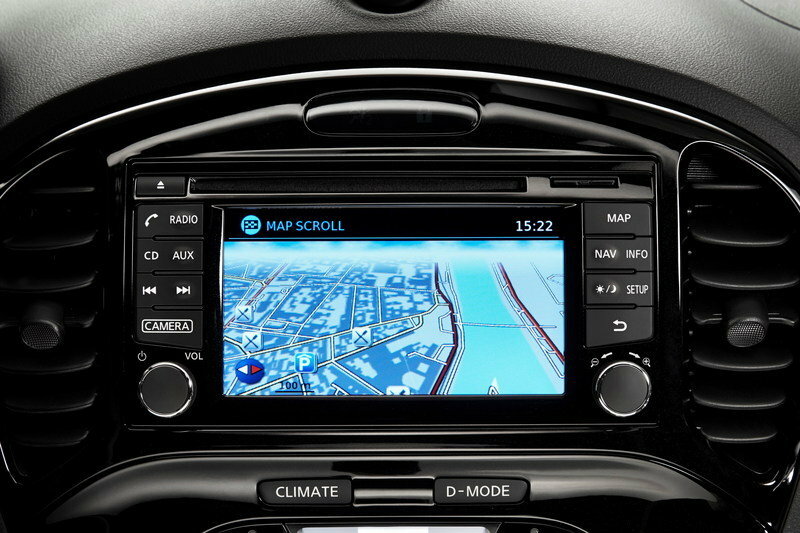 When not in infotainment mode, the screen doubles as a monitor for the newest version of Nissan’s pioneering Around View Monitor which gives a complete real-time 360 degree ‘helicopter’ view around the car to make manoeuvring as safe and easy as possible. 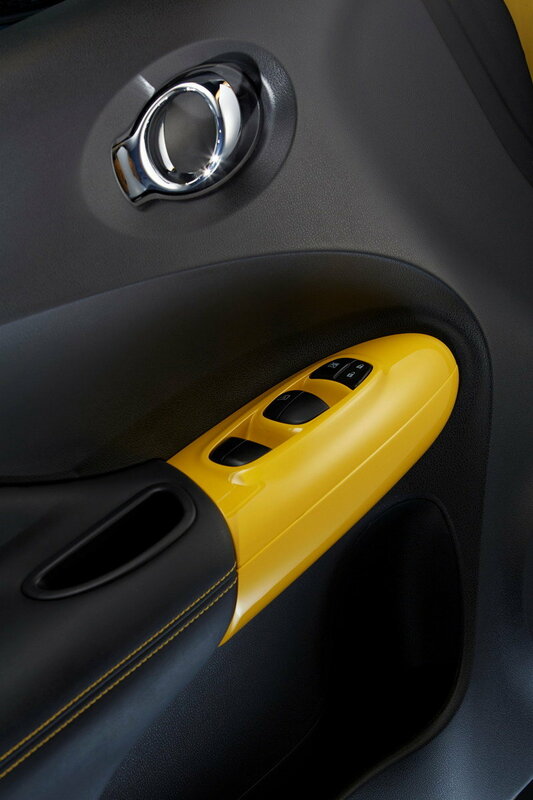 Using the AVM cameras together with sensors, radar and other advanced technology, Juke’s Safety Shield incorporates a number of features engineered to make the car as safe as possible. These include Lane Departure Warning, Blind Spot Warning and Moving Object Detection, which gives visual and audible warnings to avoid potential collisions. The final option opens a whole new world to Acenta and Tekna owners, literally. A large open-able glass panel allows not just daylight to flood into the cabin but also fresh air as required. 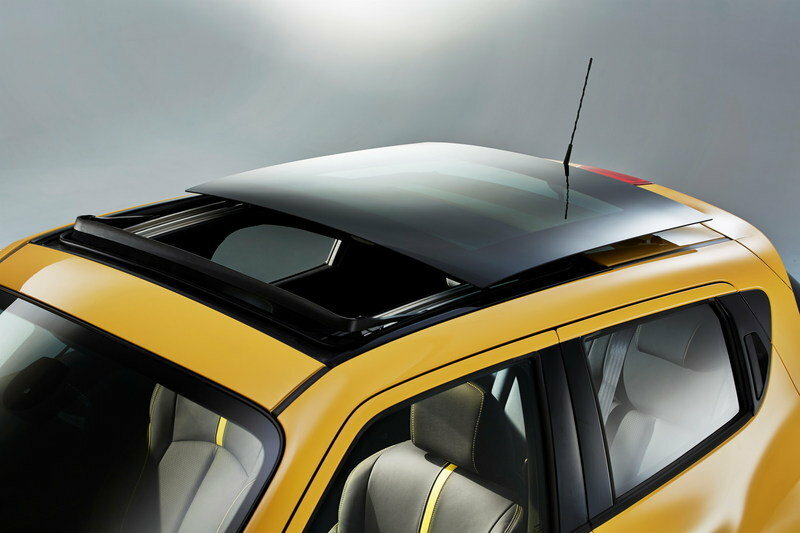 When opened, the panel sits on top of the rear portion of the roof so as not to steal interior headroom. The glass panel measures 964mm wide by 837mm long to cover two thirds of the roof area. This is matched by an opening width of 693mm and an opening length of 301mm to add to the feeling of airiness in the cockpit. Three engines are available for new Juke, with changes to the two petrol options: one is new and the other extensively revised. The existing and acclaimed 1.5 dCi diesel with 110ps (81kW) continues unchanged. The Alliance-developed 1.2-litre DIG-T petrol engine, which replaces the outgoing 117ps 1.6-litre unit, is an advanced turbocharged direct injection engine delivering 115ps (85kW) and generating 190Nm of torque. Despite its modest size, the 1.2-litre (1197cc) turbocharged engine packs a real punch, offering sharper acceleration and greater torque (190Nm) for added flexibility than the outgoing 1.6-litre naturally aspirated engine. Its lower weight, standard automatic Stop/Start feature and more fuel-efficient operation translates into cleaner and more economical performance. 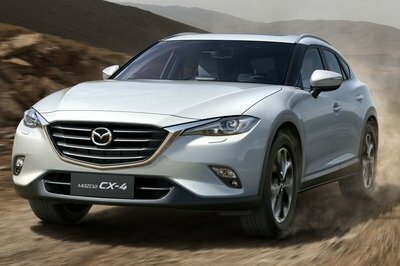 The 1.2 DIG-T engine emits 126g/km* of CO2 and has a fuel consumption figure of 5.5 l/100km*. The existing 1.6 DIG-T petrol unit has been further improved to deliver lower end torque below 2,000rpm. Producing 140kW, it is already Euro6 compliant with target emissions of 139g/km of CO2 for the 2WD versions. Among its new features are a higher combustion ratio (increased from 9.5 to 10.5:1), improved low friction technologies and cooled Exhaust Gas Recirculation. As well as a six-speed manual transmission, new Juke 1.6 DIG-T 4WD is optionally available with a new Xtronic transmission gearbox which further improves fuel efficiency, acceleration and all-round performance. "New Juke builds on the qualities that made the original such a success. Its unique crossover styling is even more energetic, and the interior makes a real statement. "The new drivetrain options and advanced technology on offer to the driver keep new Juke ahead of the rest," said Guillaume Cartier.